planetf1.com • View topic - Do any f1 stars have bad habits? Do any f1 stars have bad habits? Post subject: Do any f1 stars have bad habits? Reason I ask is I've just watched some clips of the 70s and neally every driver has a ciggy out there mouth. How times have changed , though I rekin Lewis would puff on the old weed every now and then as he knows quite a few "SO" called rap stars ( say so called cuz tupac was the greatest) and I know kimi likes a drink. So what do you know or think? Post subject: Re: Do any f1 stars have bad habits? Di Resta smokes, I think it was posted in another thread. I think it also said Rosberg did? I think Hamilton got done in 2009 for driving his car like a rebel. Does that count as a bad habit? If it does Sutil has a bad habit of shoving bottles into peoples' necks. And Ross Brawn got disqualified from driving in 2009 for speeding. Romain is constantly causing car accidents. There's plenty of drivers who can never seem to recognise when they've made a mistake. Maybe not a bad habit as such, but delusional maybe? They are human - of course they have bad habits. I think bad habits in F1 are not really bad habits unless they pass 'The Kimi Challenge'! If you use James Hunt as the yardstick all today's drivers are saints! Rosberg said a driver he knows smokes. Of course it could be him. I hope he kept all the bodywork he knocked off his own or other cars. For sponsorship. Schumi had a bad habit of trashing rooms when tiddled after having won a WDC. OK, 'habit' may be an exaggeration, but there's the 'famous' 'photo of the trashed room/trailer and, IIRC, he and Ralf trashed a hotel room or something in 'drunken exuberance' (anyone else and it would be yobbish behaviour...) at the end of a season? Can't help seeing LH's earrings as anything but a bad habit, he keeps putting them back in. You talking about Bruno? He was one of the cleanest midfield drivers this year. Nowhere near as bad as Grosjean, Maldonado or Perez. Senna was getting close to Maldonado in the points cos he kept bringing the car home. Ayrton Senna: Punching Irvine down to the floor, being the paradigm of a F1 prima-donna, and some bad on-track behavior. Alain Prost: Affairs with other girls (supposedly was kicked out of Renault for messing with the wife of one important Renault team member; also Carolina de Monaco is supposed to be on the list; also fathered a girl out of wedlock). 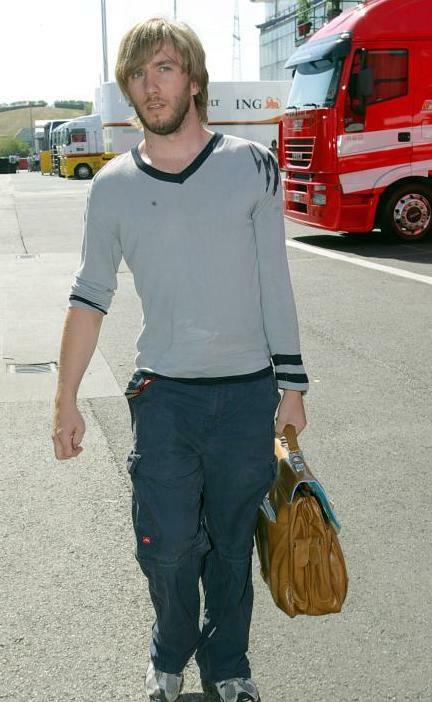 M. Schumacher: Criminal fashion sense. Some bad on-track behavior. There was a story too that he tried giving another driver orange juice with sleeping tablets in it before the start of a race. But the other guy knowing Berger declined the drink. David Letterman's list of bad F1 habits! 1. Button's poor excuse for facial hair. At least mark has a manly beard on that Cro-Magnon jaw of his. 2. Heidfeld's burly beard and ridiculous Justin Bieber do with oversized aviator glasses that went out ofd style with the last showing of Top Gun in the 80's. 4. Pic's pillow head do. Seriously guys, you're grown donkey men. Look like you took at least 2 minutes to prepare yourself for the day! 5. Marussia parking vehicles in precarious places. 6. Most F1 teams for preferring pay drivers over talented ones. 8. Caterham, HRT and Marussia for thinking coming in 10th place is the same as a win. 9. Eddie Jordan's roadkill - Needn't say anything more on this one. 10. Kubica crashing in rally cars repeatedly after almost losing life and limb in a rally car. Some folks prefer to learn the hard way and Kubica loves a challenge!!! Schuey doesn't only thrash room's. Jenson wears socks in bed. Adrian Sutil (killer) He could've easely killed the guy. Jos Verstappen has a bad habit of appearing in court accused of assault (twice) and more recently, attempted murder. By comparison Sutil is a pussycat. Lol at webber comment, I work with a Dutch guy who is neally 70 and he said he used to live next door to the verstappen family in holland. He said the whole verstappen family are gypsy and live out of a caravan and every Sunday his parents would knock on his door asking for money to buy bread, my mate said no as they were quite well of (just tight), apparently his father rebuilt old studabakers and chevs and Jos would test em out on the family property, guess that's were he learned to drive. Not really but it's something I readily notice because growing up, my mom was a hair dresser and I learned to cut hair and then relied on it to help feed myself while going to college. It was the only job I could do from home and at $10 a pop, 4-5 heads a day, plus tips, ended up yielding more money than my crappy part time job at a print shop. So yeah, I kinda notice that. Having said that, Button's scraggly facial hair is almost pathetic so perhaps it's best to just take it off. Heidfeld simply changed his look from one season to the next with no warning and it always stuck out for me and it came across as a bit of a wannabe look. Pic… Well his picture on the F1.com site says it all. first Jos didn't live in holland , he lived in the netherlands, montfort to be precise (holland is roughly the triangle between amsters, rotterdam and utrect) and montfort is very south. he was carting by 1980, and champion by 1984/5 i think. So learning to drive in a studabaker at 7 years old seems strange ?? met him a couple of times during the mid 90's while i was living over there, nice enough guy, big for an F1 driver, and very good mates with schumi. He was looked on as a god in dutch sports. Yeah maybe , just mentioning what he told me, as for holland I thought they were the same place, he said he was from the nietherlands to just typed holland easier to type on iPhone. If what your saying is true iam dissapionted as I always spoke to this guy about motorsport, this ame guy said he use to race bikes back in nietherlands. And yeah that's how he rekins Jos learned how to drive. Sorry if it's incorrect, I thought he knew his stuff. Letterman doesn't know anything about fashion, i see. 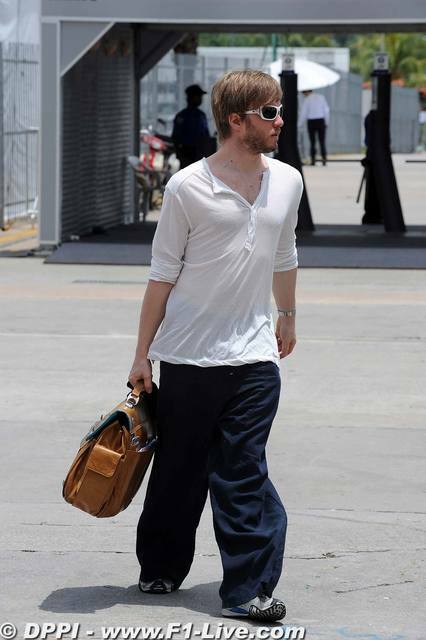 Those two (Heidfeld and Button) do have excellent fashion sense. Sorry Flavio, as a New Yorker I can honestly say with the utmost confidence... Uhm no. Interestingly I disagree with the opinion on Michael. Ole chap looks mightily fashionable sporting a shirt with jeans and matching shoes. he's had his moment in the past, but for the most part, Michael is always well dressed. Reference to Letterman is merely because he does a top ten list every night, going on, oh I dunno… 30+ years? Nothing to do with his fashion sense.